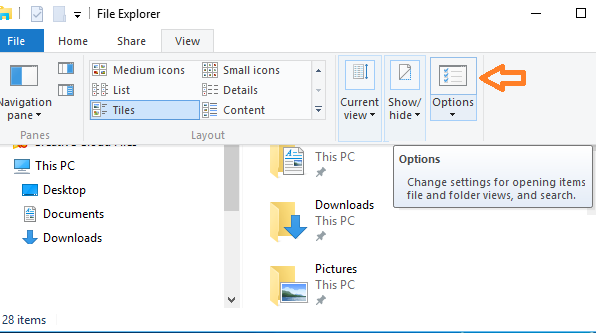 Windows 10 Quick access feature shows your frequently used folders and recently accessed files in File Explorer. While this is great feature, Windows 10 also gives you option to disable frequent folders or recent files in Quick Access. Go to View menu and click "Options" to open "Folder Options" dialog. Disable recent files: In Folder Options dialog, go to Privacy section and uncheck "Show recently used files in Quick access" to disable your recently used files from being displayed in Quick access. 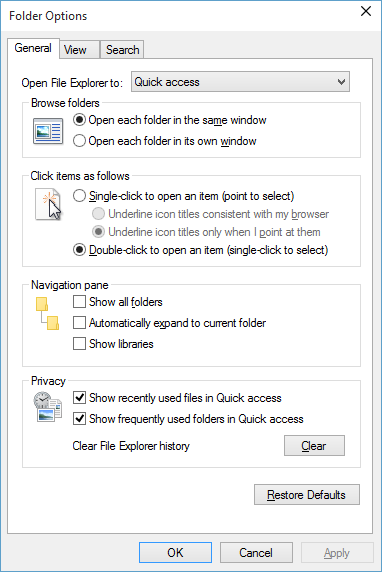 Disable frequent folders: In Folder Options dialog, go to Privacy section and uncheck "Show frequently used folders in Quick access" to disable your frequently used folders from being displayed in Quick access.